Life lessons from making art + travel news!! I got back into drawing in the last month. I've always loved drawing, but apart from now-and-then, realised I had pretty much stopped making time for it when I started my business four and a half years ago. If I'm honest, I had felt like if I wasn't going to do it totally wholeheartedly and invest a lot of time in making something absolutely AMAZING then I would just wait till 'later' when I had more time. LOL. I used to think that if I couldn't get a drawing 'perfect' then I sort-of might as well not have bothered, and I knew it was a totally irrelevant thought, but still, the perfectionist in me cringed a lil bit... So, recognising the importance of making art just for YOURSELF, and wanting to reconnect with another avenue for aligning with myself I went into making drawings this time with the intention to not have any specific goal or vision in mind, just to enjoy the experience... To go slowly and do it as long as it felt fun, as an exercise in itself. Drawing often brings me into alignment... For me it's about making space, letting go... Thoughts settling. Inspiration springing up. Peace found. Last weekend as I was sitting in the window of my favourite local coffee shop, taking some time out for myself I considered how so many of the lessons that come from making art really apply to the rest of our lives. I'd been noticing mandalas coming up EVERYWHERE! and those amazing colouring books for 'grown ups' that you can get. 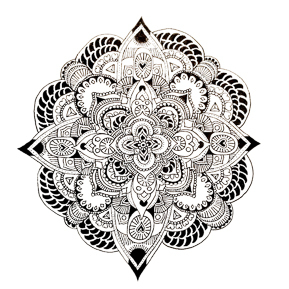 I felt like drawing mandalas would be a nice way to start getting back into it, so... Here are some of my lessons from drawing mandalas! You don't know how this is going to turn out. You don't need to know how it's going to turn out. It wouldn't be so much fun if you knew how it was going to turn out. You can make any shape work into the pattern. There are no rules. This is your page. You’re free. You are free to enjoy the creating! You can balance things up later if you want to. Or not. You can just let it be as it is. Who said it has to be symmetrical or even-sided anyway? Sometimes when I am drawing, I don’t know what bit to draw next, or where to take it. So then I stop. And when I come back to the drawing with new eyes, I immediately see which bit I’d like work on next that will enhance the picture further. But my first thought is, wow! Look how pretty that is! Where did that come from!? Look what I made!! Work slowly, at your own pace, be kind to the artist within you and be patient. Be mindful, smile, do it for the love, do it for the moment. Enjoy it for the experience of creating. Let go of any outcomes. Drawing can be like meditating, or exercising, or praying, or taking a shower! It helps you to focus on just one simple task or exercise for a little while, let everything dissolve into the background. In that place of stillness, I find fresh inspiration flowing to me. New, exciting thoughts and ideas unravel, stretch-out and play. Old, limiting thoughts sit down and shut up, or they wander off altogether. This is the mode of living where exciting things start to HAPPEN! So give it a go! See how you feel. Take your time. I hope this inspires you to do some drawing if you fancy it. And the news! You might have seen that I was in Sydney last month - I absolutely LOVED being there, what a cool place. I'm so excited to say that I'm going to be returning to Sydney/Melbourne in January through to early March (ahhhh yay!) and am available for photo-shoots! If you are interested in having your session in Australia, or have friends or clients based there that would benefit from having a personal branding photo-shoot to up-level their business (or would be a great person to know! ), I'd be so grateful if you could connect us! I have a couple of spots available for shoots in the UK before I head off next month, so if you are eager to update your photographs and start off 2016 with beautiful shiny new photography in YOUR marketing, do get in touch asap to secure your date! Email me now at becky@beckyrui.com. Or come meet me in Australia?